Tunxis Plantation yesterday. We had some rain and snow a little later, but nothing golf-threatening. 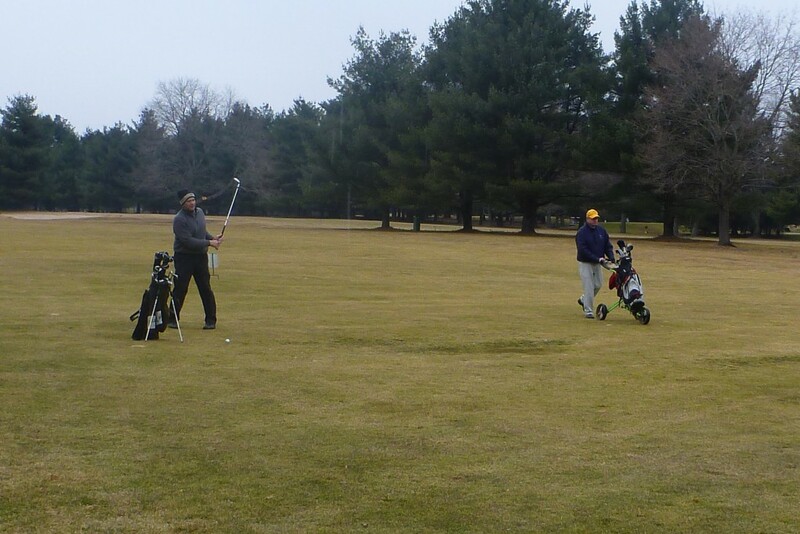 Last week, Hacker (real name) and I had to travel an hour west to find an open golf course; yesterday, we had to travel an hour east, to Tunxis Plantation, in Farmington, Connecticut. We were joined by Mike A., whose company makes boxes, and by our home-course superintendent, who was taking a day off from cutting down trees. On one hole late in the match, my partner (our superintendent) used one of his strokes to force Hacker and Mike A. to spend three of theirs. Nevertheless, we lost both the back and the overall on the seventeenth—although we did win a consolation press on the final hole. This entry was posted in Games, Golf Courses, Hacker (real name) and tagged Stroke Bank, Tunxis Plantation by David Owen. Bookmark the permalink.